I always loved the idea of loose-leaf tea, and over the years I tried various tea infusers that all eventually ended up in a junk drawer. 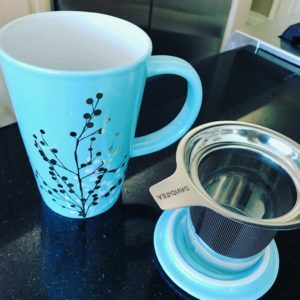 For a couple years I used Twining’s English Breakfast k-cups in my Keurig, but the waste bothered me and the taste was just fine, though not spectacular. David’s Tea opened near me about a year ago and it totally changed how I use loose-leaf tea. I love their Organic Breakfast Blend, but they also have tons of flavors both with and without caffeine. For me the best part is that they have two genius ways to brew their loose-leaf tea. For on-the-go, they sell cute little drawstring tea filters. For at-home, I just bought David’s Perfect Mug and I’m loving it. For iced tea, I did buy David’s pitcher but it remains in the back of my pantry gathering dust, so that’s not a Perfect Kitchen Match for me. If you’re looking for an easy way to brew loose-leaf tea at home, I recommend David’s Tea! NOTE: I purchased all of the David’s Tea products myself, and nothing was sent to me.